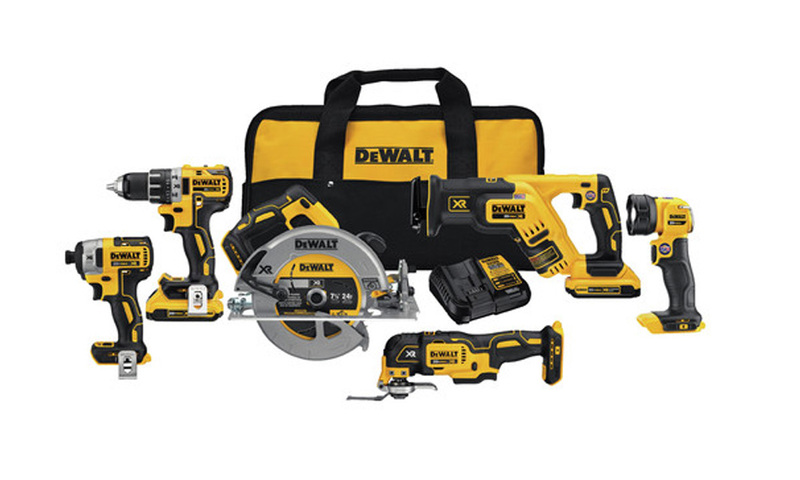 It seems like there’s always a new model of cordless combo kit being launched every week. A good example is the 20V DeWalt combo kit brushless. This is one of the top performing compact cordless tool sets on the market today. It’s a powerful combo kit with 6-tools that delivers enough power to handle any domestic or construction job with ease. The brushless DeWalt combo kit comes with powerful motors that give you up to 30% greater application speeds than most of the other similar tools out there. Let’s look at the 6 brushless tools of the DeWalt 20V combo kit. The 20V Dewalt drill driver comes with a 3-speed all-metal transmission. It features a half-inch self-tightening chuck that delivers 535 Units Watts for faster application speed, best bit retention, and superior performance. It also comes with 11 torque settings and an easy to control metal ring that allows the users to move to their desired settings with much ease. Users can easily adjust drilling speed, torque, screw-drilling, and hammer-drilling using the drill’s gear shifter and torque collar. Impact drivers are the all-time rage in the tools market today. So how does the 20V DeWalt Max XR impact driver hold up against the rest? Well, with a torque of 1825 in-lbs, 3800 bpm, and 3250 Max RPM, this quarter-inch model is without a doubt ranked among the most powerful impact drivers on the market today. The DeWalt 20V Max cordless brushless impact driver has a compact design that’s perfect for fitting in small spaces without compromising productivity. It also features three LED lights that illuminate your working area and make it easier and safer to work in the dark. It’s also lightweight at just 2.8 pounds which makes it even more suitable for working in tight cumbersome spaces. The impact driver also comes with a handy ¼ -inch quick release hex shank and three operating modes. The tool’s user can easily increase torque and RPM with each mode. Mode 1 is a high precision mode, while modes 2 and 3 are normal impact modes. The precision mode is perfect for light projects that don’t require a lot of force. With the rise of lithium-ion technology, cordless tools incorporating circular tools have become quite popular too. The DeWalt Max XR’s cordless circular saw hasn’t been left behind in the cordless tools race. The DeWalt circular saw provides users with the same power and depth of cut they could previously get from a corded circular saw but this time with the added benefits of portability and cordless convenience. The circular saw uses a 7 ¼ -inch blade with 2 9/16 inch cutting capacity at an angle of 90 degrees. Other key features of this circular saw include a smooth running brushless motor, a bright LED cut line light, a metal blade guard for maximum safety, a blade brake, bevel detents at 22.5 and 45 degrees angles, and right side blade orientation. In terms of performance, the DeWalt 20V Max XR circular saw doesn’t disappoint. It gives perfect crosscuts and easily cuts through plywood, lumber, PT, and MDF. It’s designed for excellent performance and extreme durability. The oscillating multi-tool comes with a variety of handy attachments and a powerful 20V battery to handle a wide range of jobs. It’s the go-to solution for those who want to get their commercial repair or domestic DIY jobs completed fast and efficiently. The oscillating tool set includes 28 pieces of handy accessories and is powered by a 20V MAX battery. It has a speed of 0 to 20,000 oscillations per minute and an oscillating angle of 1.6 degrees x 2. It gives users a tool-free blade change and LED light for working in dark places. Other key features of the oscillating multi-tool include quick blade change, powerful and reliable performance, and long battery life. The DeWalt oscillating multi-tool features LED light to illuminate workspaces and give the user a precise cut, cordless convenience, long life battery, quick accessory changing system, variable speed trigger, a dual grip for better control, and 28 accessories to handle most of your home and workplace repair tasks. It’s a single tool solution for a wide range of applications including sanding, cutting, scraping, and even mortar and grout removal. The 20V DeWalt reciprocating saw is a compact and extremely lightweight saw weighing just 5.0 pounds. Makes it easy to use for a long duration of time. It’s also the shortest reciprocating saw in the 18/20V range with a length of just 14 ½ inches. Its compact size ensures that the saw can get in tight spaces easily and handle intricate cutting tasks with ease. The reciprocating saw has a 4-position blade clamp, lock-out switch, LED light to brighten working areas, variable speed trigger that delivers 0-2.900 strokes per minute. The LED work light provides the tool’s users with extra light to illuminate their work areas when needed. Users of the tool don’t need to haul large lamps or flashlights when they can simply flick a switch on the tool to light up the area where they are working on. 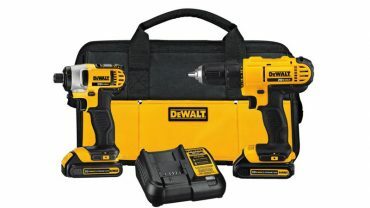 The 20V DeWalt combo kits come with two batteries – a 2Ah battery and a high capacity 4Ah battery. Each battery can be used for appropriate tasks. For example, if you want to drill bigger holes then use a bigger battery while a smaller battery can be used for lighter jobs. The DeWalt toolset uses the 20-Volt MAX Lithium-Ion battery system with over 60% more capacity than standard 20V batteries. The set also comes with a charger that can charge the battery pack in less than 1 hour. Each battery comes with an LED fuel gauge for checking the battery’s power level on the go. The DeWalt 20V brushless combo kit comes with a convenient canvas bag to hold your accessories and parts. It’s a portable tool with a strong, well-designed canvas carry bag. The DeWalt 20V MAX XR brushless combo kit is a perfect combination of handy tools and accessories. It’s a great option for anyone who wants quality and excellent performance in a toolset. Carpenters and DIY enthusiasts will love the kit’s drill and impact performance. It’s a versatile tool for all types of commercial and domestic woodwork and masonry projects. The high-quality power tool is portable, lightweight, and powerful enough to handle a vast majority of home improvement and repair tasks.